Could the elixir of youth be as simple as a protein found in young blood? GDF11 (45 kDa) also known as bone morphogenetic protein (BMP-11), encoded by GDF11 gene, is a member bone morphogenetic protein (BMP) family and the TGF-beta superfamily. The members of this family are regulators of cell growth and differentiation in both embryonic and adult tissues. GDF11 is an homodimer disulfide-linked protein, composed by 407 aminoacids. In human the GDF11 gene is localized on the 12 (location Chromosome 12: 56,137,064-56,150,911). The GDF11 gene is expressed in the pancreas, intestine, kidney, skeletal muscle, and developing nervous system. Among the diseases and disorders associated with advancing age, one of the most debilitating is the loss of normal cardiac function leading to heart failure. Heart failure affects approximately 1% of individuals over 50 and over 5% of individuals over 75. In parabiosis, two mice are surgically joined such that they develop a shared blood circulation with rapid and continuous exchange of cells and soluble factors at physiological levels through their common circulatory system. The pair of animals may be the same age ( isochronic parabionts ) or different ages ( heterochronic parabionts ). Because parabiotic mice are connected solely through their common circulation, parabiosis is a powerful model to determine whether circulating factors can alter tissue function. Left ventricular hypertrophy is an important feature of cardiac aging, contributing to diastolic dysfunction and heart failure with preserved systolic function. Moreover, patients with diastolic dysfunction tend to be older and are more likely to be obese, diabetic, hypertensive, and female, compared to patients with systolic dysfunction suggesting distinct underlying pathological mechanisms. The aging of cardiac phenotype is reversible upon exposure to factors in a young circulation, this younger look was obtained using surgically anastomosed parabiotic mice. 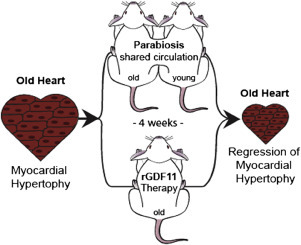 The exposure of old mice to a young circulation via parabiosis reproducibly led to a reversal of cardiac myocyte hypertrophy in a gender-independent fashion and this reduced cardiomyocyte size translated into a reduction in global cardiac mass. This structural transformation is accompanied by a reduction in myocardial gene expression of natriuretic peptides known to promote maladaptive cardiac remodeling and an increase in Ca2+ ATPase (SERCA-2), the expression of which is integral to myocardial relaxation and hence normal diastolic function. GDF11 emerged as a strong candidate factor present at higher levels in the blood of young mice and can mediate the antihypertrophic effect. Although GDF11 expression is detectable in a range of tissues, the spleen shows the highest concentration and exhibits an age-dependent decline in GDF11 levels. Thus, the spleen may contribute to circulating GDF11, and an age-related production or secretory defect in the spleen could participate in the reduction in circulating GDF11 in old mice. The treatment of cachexic mice with soluble ActRIIB protein (sActRIIB), which antagonizes signaling by GDF11 (as well as myostatin, activin, and other TGF-b family members, given the promiscuity of the receptors) reverses cardiac atrophy in tumor-bearing animals. Furthermore recombinant GDF11 (rGDF11) therapy for 30 days led to a significant regression of cardiac hypertrophy in old mice. GDF11 is ineffective in preventing cardiac hypertrophy in the context of pressure overload, for these reasons the antihypertrophic properties of GDF11 may not be generalizable to all forms of cardiac hypertrophy. Recently identified in the circulation of humans, GDF11, like other TGF-b family members, circulates at significantly lower concentrations in humans compared to mice. Although low levels of GDF11 identify a cohort among humans with stable coronary artery disease with a higher risk for composite endpoint of all-cause mortality, myocardial infarction, heart failure, and stroke. Future studies will be necessary to evaluate the role of GDF11 in human cardiac hypertrophy, because cardiac hypertrophy of aging is a multifactorial process and the observed regression of cardiac hypertrophy in old mice exposed to a young circulation is unlikely to be attributable entirely to the replenishment of a single factor but there are therapeutic possibilities for targeting cardiac hypertrophy of aging by restoring youthful levels of circulating GDF11. 4 weeks of daily GDF11 injections works nearly as well as parabiosis in helping elderly mice recover from a muscle injury and boosts their performance on running and grip strength tests. GDF11 also encourages growth of new blood vessels and olfactory neurons in the mouse brain. In both muscle and the brain, GDF11 appears to work in part by restoring the function of aging stem cells so that they can differentiate into adult tissues. Parabiosis can rejuvenate another part of the mouse brain, the hippocampus, where memories are made and stored. Old mice that underwent parabiosis formed more new connections between nerve cells there. Although no rejuvenation factors from the young blood have been isolated, giving old mice injections of young mouse plasma, or blood from which red and white cells have been removed, can bring to similar effects on the hippocampal neurons. The old mice also performed significantly better than untreated animals on tests of learning and memory.